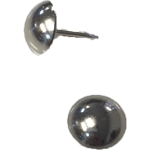 Do you need chair hardware for your antique, vintage-style or reproduction chair? At Kennedy Hardware, we've got the pieces you need for your furniture repair or chair restoration project, including caning, fiberboard seats and Morris Chair parts. If you are restoring a cane-bottom or cane-back chair, or building one from scratch, we've got essential chair caning supplies, starting with the cane mesh itself. 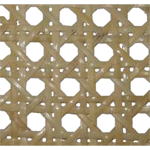 We carry ½ inch fine open mesh pre-woven caning, sold by the foot in 14, 16, 18 and 24-inch widths. And of course, we carry other chair hardware supplies you need to finish your caning project: cane spline, binder cane, weaving hanks, caning pegs and more. And if you aren't sure how to undertake your project, be sure to order our super-affordable booklet, Cane Seats for Chairs, with 18 pages of instructions and photos to help you restore or create the perfect cane chair. 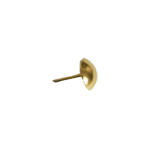 We offer a nice selection of fiberboard chair hardware, too. If you need new fiberboard seats, for example, we've got several classic patterns to choose from. 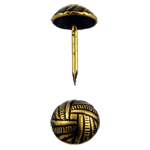 We've got nails and an assortment of ornamental tacks to complete your project, too. 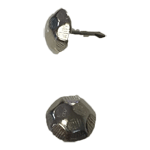 We even carry a nail and tack spacer for perfectly even tack spacing every time. And if you've got an antique or reproduction Morris Chair, Kennedy Hardware can help you return it to perfect operating condition with our restoration rods and brackets. Whatever your vintage, antique and restoration furniture needs, Kennedy Hardware is your chair hardware headquarters!